The Jabra BIZ 1900 Duo is a cost-effective corded binaural headset offering a professional level of performance for clear phone calls and maximum user comfort. In spite of its relatively low price tag, the headset does not compromise on quality, and it includes a noise-cancelling microphone making it suitable for use in almost any office environment. The Jabra BIZ 1900 Duo offers premium audio quality at an affordable price. It uses peak-stop technology to protect the wearer from sudden loud noises and prevent interruption while on a phone call. A flexible microphone boom ensures maximum comfort and recording quality, while noise-cancelling technology helps to keep phone calls clear even in noisy environments. The Jabra BIZ 1900 Duo provides in-line controls for altering call volume or muting calls, while adjustable ear-cups and headbands help to ensure maximum comfort for any user. 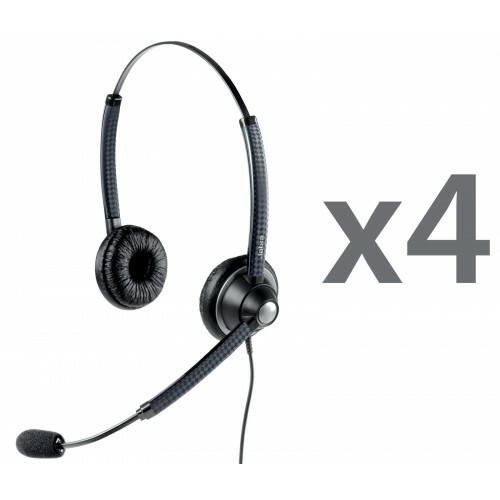 For added convenience, the headset ships with a quick disconnect plug allowing for instant plug-and-play connectivity with most amplifiers other telephone systems as well as a USB plug for instant computer connectivity. This set of four Jabra BIZ 1900 Duo headsets is ideal for the budget-conscious small business which is not prepared to compromise on quality.